Pesticides are chemical agents used to control insects (insecticides), weeds (herbicides), fungus (fungicides), and other "pests". Aphids, grasshoppers, and other plant eating insects are examples of pests that can endanger a farmer's crops. The farmer would spray with a pesticide (usually ahead of time) in order to kill the insects and protect his or her crops. Pesticides have revolutionized modern agriculture but have become a problem due to their danger to people and animals other than the pests. 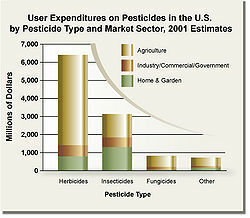 Pesticides can be categorized by chemical makeup, by toxicity and persistence, by target species, and by method of application. Of the approximately 1 million species of insects, about 10,000 species eat human crops, but most damage to crops, whether in the field or stored, is caused by about 700 insect species. 2.10 Compounds that disrupt energy metabolism - Rotenone, etc. Not counting the use of mud and smoke on skin to repel insects, the first references to what would be called insecticides or pesticides come from about 1000 B.C. when sulfur was burned to fumigate houses and plants. Pliny noted the use of gall from a lizard to protect apples from decay. Later people used soapy water, pepper, tobacco, vinegar, lye, brine and other things. Before World War II, arsenic based insecticides were used, as well as some naturally occurring substances such as rotenone, sulfur, and pyrethrum (made from chrysanthemum flowers), as well as cyanide, and even the mineral cryolite was used. During World War II (1940), the Organochlorine insecticides were discovered which were really the first synthetic chemicals used for insect control. Paul Müller of the J. R. Geigy company in Switzerland, found that a certain powder killed flies and other insects even in very small amounts, this was DDT. At the beginning of the war, in the Pacific theater, General Douglas MacArthur complained that at any one time, up to two thirds of his soldiers were sick with Malaria. Spraying with DDT made a major difference in controlling insect borne disease during the war as well as immediately after. Now, because of environmental concerns and human and animal toxicity questions the Organochlorines have been removed from use. Natural Pyrethrins were originally found in chrysanthemum flowers. With time, compounds that were unstable in actual use outside the laboratory were eliminated, and the type 2 pyrethroids (like tefluthrin) which had an alcohol branch added were much more stable and nearly ten times more effective against insects. Type 1 compounds cause convulsions and hyperexcitability in insects and tremors of the whole body in mammals. Type 2 compounds cause lack of coordination in insects, and salivation and writhing in animals. Human skin will have a burning feeling with contact with sufficient type 2 pyrethroids. Sabadilla is found in the seeds of plants from the Schoenocaulon genus, related to the lily family. It is used in organic gardening because it is much more toxic to insects than to mammals. The veratrum alkaloids, such as veratridine and cevadine, make up a part of the Sabadilla extract. With high enough dosage, muscles become rigid in both insects and animals, though the effect is with much lower dosages in insects. Mammals may sneeze violently because of mucous membrane irritation. Various different Ryanoids are found in the woody stem of the bush Ryania speciosa, found in the Amazon Rain Forest. The name of the plant in Brazil is Mata-Calada which means silent killer. Though the poison found in the wood is much more toxic to insects than to mammmals, people are said to have died from using branches from this bush as spits to roast meat over a campfire. The plant is classified now as part of the Salicaceae family (which includes willows and cottonwood) of the Salicales order  though some include it in the Malpighiales order. Ryanodine and other ryanoids cause paralysis in both insects and mammals by causing muscles to contract for a sustained time. Nicotine from tobacco plants has been used as an insecticide since the 1700's. It dissolves well in water and if it lands on an insect it penetrates the shell easily. Since it also penetrates human skin, it is somewhat dangerous to handle. The new compound, imidacloprid, which is a nitroguanidine, works well if the insect consumes it and is much less toxic to mammals. It works by blocking a nerve chemical which allows acetylcholine to accumulate, causing paralysis. The organophosphorus insecticides are often very different from one another except that all have molecules which are built around a central phosphorus atom. Some dissolve in water and most dissolve in organic solvents that are refined from petroleum. They vary in toxicity, but many are toxic to mammals as well as to insects. Most organophosphorus insecticides work by binding to the acetylcholinesterase enzyme and keeps it from breaking down acetylcholine molecules. This provokes at low doses, restlessness and excitability, then, at higher doses provokes tremors and paralysis. These insecticides generally work more slowly than the pyrethroids, and can take days before allowing the enzyme molecules to function again. There are various carbamate insecticides, but all have a branch which is carbamic acid. Most only dissolve in petroleum derived organic solvents, but some can be manufactured which dissolve in water and can be taken up by plants to protect the plants from insects. The insecticides are usually very toxic to mammals, so handling is a problem, and they are especially toxic to beneficial insects like honeybees. Carbamate insecticides work similarly to organophosphorous insecticides, but will release the acetylcholinesterase enzyme molecule in minutes rather than hours. Insects have a neurotransmitter called Octopamine which was first found in the octopus in 1948 and which helps control muscle action. The chlordimeform compounds have a possibility of causing cancer, but amitraz is more used since it has only a moderate toxicity for mammals. It can cause insects to tremble and to fly without stopping, and can stop them from eating and reproducing as well. These insecticides include some of the oldest commercial insecticides such as dieldrin and endrin which are very long lasting in the environment. These products were very toxic for mammals and easily absorbed through the skin. Now, biodegradable products such as lindane and endosulfan are used. The new product, Fipronil, is a member of this group of insecticides. It is used on dogs against ticks and fleas, is more selective against insects and safer for mammals. The Frontline brand has 1.34 ml of liquid that contains 100 g/l of fipronil  so it contains 134 mg of fipronil for a 10- 20 kg dog. The absorption of fipronil is about 1% of the amount on the skin, and the toxic amount is thought to be about 90 mg/kg of body weight so the product is considered safe, though it allows residues to stay in the animal for some time. Though humans are heavier than dogs, it is best to avoid all skin contact. These chemicals keep GABA from regulating nerve impulses and so cause twitching, convulsions and hyperexcitability. They kill insects by this overstimulation. Avermectins were first isolated from the fungus Streptomyces avermitilis and are used in the insecticide abamectin. The insecticide Emamectin has been synthesized which works especially well against caterpillars. Avermectins do not dissolve in water and so need some other solvent to disperse the insecticide. They are highly toxic for mammals, but soak into leaves which are eaten by insects and yet the toxins are biodegradable because they break down in sunlight. Avermectins have an effect on nerves similar to GABA but is irreversible. They cause tremors in mammals (and presumably paralysis in high doses) and kill insects by muscle paralysis. Compounds that disrupt energy metabolism - Rotenone, etc. Rotenone is isolated from the roots and stems of some plants. Emmanuel Geoffroy first discovered the poison in the roots of the vine now classified in the family Fabaceae as Lonchocarpus nicou, which he found in French Guiana in the 1890's. It is now associated with Derris Root, of the same family but Genus Millettia, found in Southeast Asia. Rotenone, as well as the synthetic compounds fenazaquin, pyridaben, sulfluramid and others, work by disrupting energy metabolism. They disrupt the functioning of mitochondria in cells by stopping the production of ATP. Rotenone is especially toxic for fish, and more toxic for insects than for mammals. Rotenone has been used to kill all fish in a lake to rid the lake of an invasive species (such as pike in Lake Davis, California) so that the lake can then be restocked. Insects must have a strong exoskeleton (often referred to as cuticle) to survive, and so the chitin that provides strength to their cuticle is important to the organism. Some compounds prevent chitin from forming, and so keeps the exoskeleton too weak and brittle to support the insect, especially during a molt. These compounds are called benzoylphenylureas, and the most often used compound is diflubenzuron. These compounds do not dissolve easily in water, and are not very toxic for mammals. Insects go through various stages of growth, depending on the kind of insect. They often start as larvae, sometimes enter a pupal stage and emerge as adults. Chemicals that resemble juvenile hormones take up the spaces in the cells that the hormones would use and block their action. Thus the insects cannot develop normally, or adults cannot reproduce. Two compounds that are often used are methoprene and fenoxycarb. They both need organic solvents to dissolve and have extremely low toxicity for mammals. The Bacillus thuringiensis forms spores that are insecticidal if eaten by insects. The spores contain proteins that become active in the midgut of the insect, and bind the cells so that potassium and acid levels cannot be controlled, killing the insect. 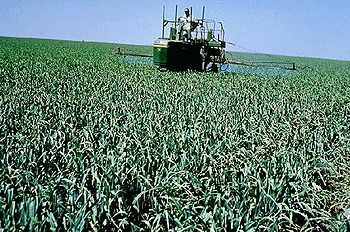 Potential Pesticide Runoff from Cropland. Well over 500 million pounds (active ingredient) of pesticides have been applied annually on farmland since the 1980s, and certain chemicals can travel far from where they are applied. The US Geological Survey, as part of the National Water Quality Assessment Program, measured pesticide concentrations in streams and wells in areas using pesticides. They found pesticide concentrations exceeded one or more human-health benchmarks in about 10 percent of agricultural streams examined and in about 1 percent of sampled wells used for drinking water in agricultural areas. Pesticide residues reaching surface-water systems may harm freshwater and marine organisms, damaging recreational and commercial fisheries. Pesticides in drinking water supplies may also pose risks to human health. Exposure to high concentrations of organophosphate pesticides like chlorpyrifos and diazinon can affect the nervous system, leading to headache, dizziness, weakness and blurred vision. Research has shown that some people are more sensitive to the effects of these compounds than others, while infants and children appear to be the most vulnerable. ↑ 1.0 1.1 1.2 1.3 1.4 An Introduction to Insecticides (4th edition) Radcliffe's Integrated Pest Management World Textbook, University of Minnesota. By George Ware and David Whiteacre. Accessed 10 July 2010. ↑ 2.0 2.1 The Mosquito Killer, by Malcolm Gladwell, Gladwell.com, from the New Yorker Archive July 2, 2001. Accessed September 15, 2010. ↑ Tropical Biodiversity - The Amazon - Santarém - Pará Brasil blog by Steven Alexander. Accessed 16 July, 2010. ↑ Salicaceae Wikipedea, Accessed 16 July, 2010. ↑ Imidacloprid EXTOXNET, the Extension Toxicology Network, A Pesticide Information Project of Cooperative Extension Offices of Cornell University, Michigan State University, Oregon State University, and University of California at Davis. Major support by USDA/Extension Service/National Agricultural Pesticide Impact Assessment Program. Accessed July 16, 2010. ↑ Octopamine Wikipedea, Accessed 17 July, 2010. ↑ Rotenone Wikipedia article. Accessed 11 September 2010. ↑ Lake poisoning seems to have worked to kill invasive pike San Francisco Chronicle, October 3, 2007. Accessed 11 September 2010. ↑ 14.0 14.1 14.2 Environmental Interactions with Agricultural Production: Background by the U.S. Department of Agriculture. Accessed September 14, 2010. ↑ Pesticides & Neurodevelopment by the National Institute of Environmental Health Sciences. Accessed September 14, 2010. An Introduction to Insecticides (4th edition) Radcliffe's Integrated Pest Management World Textbook, University of Minnesota. Accessed 10 July 2010. National Pesticide Information Center University of Oregon. Accessed 10 July 2010. EXTOXNET, the Extension Toxicology Network, A Pesticide Information Project of Cooperative Extension Offices of Cornell University, Michigan State University, Oregon State University, and University of California at Davis. Major support by USDA/Extension Service/National Agricultural Pesticide Impact Assessment Program. Accessed July 16, 2010. Recognition and Management of Pesticide Poisonings 5th edition, 1999. J. Reigart, M.D., James Roberts, M.D., supported by the US Environmental Protection Agency. Accessed July 16, 2010. The Mosquito Killer, by Malcolm Gladwell, Gladwell.com, from the New Yorker Archive July 2, 2001. Accessed September 15, 2010. This page was last modified on 9 May 2013, at 11:18.